This morning the U.S. Bureau of Economic Analysis released 2011 GDP estimates for Metropolitan Statistical Areas across the country, along with revisions to 2001-2010 data. While we’re already into 2013, it can be useful to go back and examine some of these changes to get a better sense of what is going on in each of these local economies. 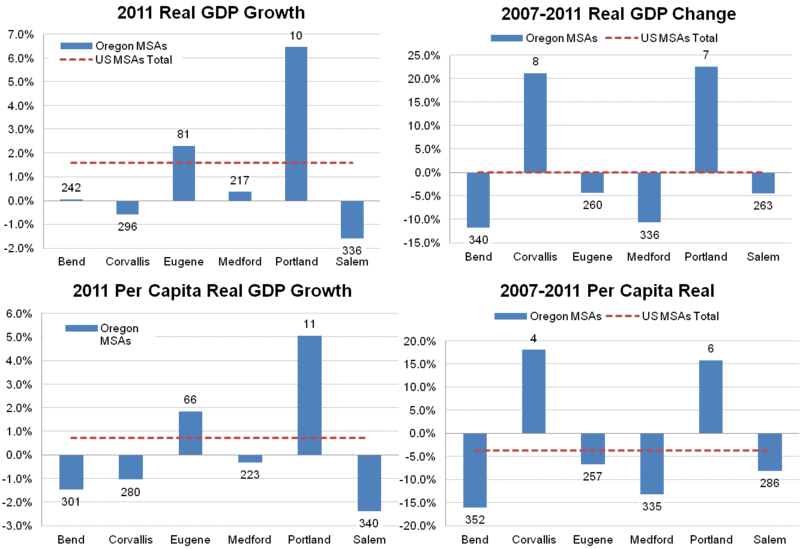 The following graphs take a quick look at this data and how Oregon’s MSAs compare with other cities around the country. To flesh out the comparisons, I have also included personal income changes and total employment changes as none of these indicators alone provides a complete picture of the economy. I have arranged the graphs so that the ones on the left show the 2011 growth rates while the ones on the right show the 2007 to 2011 changes to gauge where we are today relative to the pre-recession peak. The numbers above each blue bar represent the relative ranking across all 366 MSAs in the country. A ranking of 1 indicates the strongest growth and a ranking of 366 is the weakest growth. The story across both real GDP growth and real per capita GDP growth is similar. One of the main themes that emerges when you look across states or across cities is the housing bubble and bust. Across a whole swath of variables, the bigger the bubble, the harder the fall and the more ground that needs to be made up before reaching pre-recession levels. This certainly can be seen within Oregon as Bend and Medford were particularly hard hit by the housing cycle. We know that Oregon overall usually ranks well in terms of GDP due largely to our extermely producitive high tech sector, of which the majority of the industry is in the Portland MSA, so it is no surprise to see Portland’s growth in 2011 and across the business cycle is among the best in the country. One area that has performed well in terms of GDP, and maybe somewhat surprising to some readers, is Corvallis. When examining the data more thoroughly this is more a function of Corvallis not having much of a downturn as opposed to any real strong growth in the region. However, stability or slow growth in recent years when compared with the rest of the country means you’re doing very well. In terms of income, in 2011 only Portland’s total personal income grew faster than the US metropolitan areas total. It should be noted that these data are not adjusted for inflation as trying to do so for all 366 MSAs would be time consuming, to say the least. However the relative rankings would remain very similar as inflation rates across most regions of the country are similar. Over the business cycle to date the two hardest hit housing areas show the lowest levels of income gains. The same general story is usually found across most economic variables however it can be useful to see these comparisons with different metrics. As discussed many times by our office, the Portland MSA has been driving growth in the state these past couple of years, however we are beginning to see some growth outside of Portland. Corvallis and the Columbia Gorge have also been regions of strength. Today, we’re now seeing income gains across the state and employment is beginning to pick up somewhat in the larger cities, although not all regions have seen sustained job gains just yet. As these regions move toward expansion, driven in part by the housing rebound, the overall rate of growth for the state should improve.